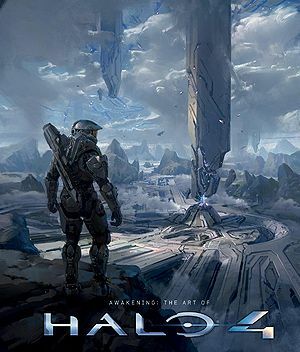 Awakening: The Art of Halo 4 is a hardcover art book that chronicles the artwork behind Halo 4. Published by reference/companion and art book specialists Titan Books, Awakening was written by Paul Davies, a Halo enthusiast and gaming journalist for Official Nintendo and Computer & Video Games. It was released on November 6th, 2012. Awakening begins with a foreword by Kenneth Scott. The first chapter "Environments" features concepts for every level of the game from start to finish plus a pre-production section at the end. The second chapter "UNSC" showcases studies of the Master Chief and Cortana; the rest of this chapter along with chapter three, "Covenant", feature human and Covenant troop, weapon and vehicle concepts respectively. The fourth chapter "Forerunner" first showcases character designs from different Promethean classes to the Ur-Didact, before continuing with concepts of the Cryptum and Forerunner weapons. The fifth and final chapter "War Games" features multiplayer map designs as well as different armor permutations in Halo 4. An acknowledgements page along accompanied by a piece by Robogabo finishes the book. A 1,000 numbered copy UK-exclusive limited edition was also released. This edition features a unique holographic slipcase cover as well as alternate front cover art. A hand-signed print of Shutdown concept art by John Liberto is also included. All contents of the Limited Edition. Limited Edition slipcase and alternate front cover art (front view). Limited Edition alternate front cover art. Limited Edition alternate front cover art (bottom). Limited Edition holographic slipcase close-up (top). Limited Edition holographic slipcase close-up (bottom). Limited Edition alternate front cover art close-up. Pelican flight art print by John Liberto. Pelican flight art print close-up (note signature at bottom of print).